Your event is around the corner and there is one thing you’ve dropped the ball on—collecting information about one of your panel speakers! You’ve spent weeks promoting to get everyone excited but now you realize you have nothing to say when it is time for the panel discussion. Yes, this happened to event organizer, K. Majorsky, but this nightmare doesn’t have to be something you relive. There are brilliant ways to prevent or fix issues by leveraging event technology. It’s pretty much like having a “smart assistant.” And like any good sidekick, a right event tech is easy to talk to, reliable, and most importantly—the ultimate fixer! Here, see what are the 7 event planning nightmares that often haunt event planners’ dreams and how we can conquer the fear. Nightmare: this happens all the time at events. You want to get the most up to date information on the agenda and room changes to your attendees as soon as possible. A timely announcement to the entire event will prevent confusion and frustration. But how would you make an announcement? By email, shouting through a microphone, creating a sign, or sending a push-notification through an event app? Your outdated web and paper agendas will confuse attendees no matter how you announce the update. But with event management software you can update your web agenda and event app all at once. When you create an agenda webpage, just copy and paste one line that the event management software provides. Save time creating an web agenda and get it auto-updated with your app. In terms of getting the message out, forget grabbing your laptop, drafting an email, and adding attendees one by one. Instead, you can quickly send an in-app notification and opt to send the message via email right from the app. If only a certain group of attendees need the update, you can specify who as well. If you were better prepared, you could have provided alternate transportation and reassured attendees the weather would not get in the way. Now, you’re looking at your ultimate nightmare—a room full of empty seats and disappointed speakers feeling like they’ve wasted their time! Make attendees pay for tickets and use online event registration. Even a $5 or $10 ticket would be enough to get people to commit rain or shine. Think about how you’re marketing your event. Create a dialogue rather than speaking at attendees whether on social media, email campaigns, event directories, or youtube. Whova’s Community Board is one way attendees can interact with speakers and fellow attendees via different discussion topics or ask important event-related questions. Here check 9 steps to get attendees engaged from 2 weeks before an event. Getting attendees to share articles or attend a city tour the day before are other great ways to help break the ice. By making connections before the event, they have more of a reason to show up. The best part—an event app can do all of this! Have a good one that provides more than a mobile brochure. Nightmare: Venue, speaker lineup (agenda), and food—the three most important factors both organizers and guests care about. And while having more people than expected is nice for attendance, a shortage of food can leave a bad taste in a lot of unfed mouths. Not to mention, it’s hard to put in a last-minute order for 100 or increase your budget without warning. So how can you prevent having an angry mob or resolve it right away? Get an accurate attendance estimate by leveraging a pre-event survey or a live poll in an event app (download the question templates here). If you notice, the count is more than you planned for, you can bump up your catering order and make proper adjustments to the budget in advance. This also comes in handy for an instant headcount during an event. If you realize your nightmare is coming to life and you will soon have negative live tweets, use your app to turn it around. By encouraging attendees to grab a bite to eat you’ll avoid hungry guests. Organizer, E. Reed did just that by using the Community Board in the Whova app. When he saw food dwindling, he created a “Meal on your own” social group and motivated attendees to join. This led some attendees to spark a new conversation with the separate topic, “Recommend local restaurants.” They had a great time together, shared photos on the app, and most importantly—solved the food issue on their own. Nightmare: One of your speakers missed her flight, and the session is in 3 hours. Yes, this is out of your control, but as a professional event organizer, you want to execute a plan B quickly. What would you do? One of our customers handled this exact situation without skipping a beat. She took a live poll from the event app to survey which speakers attendees were enjoying the most. With this information, she asked one of the “most-voted” for speakers to present their talk again. The event had multiple concurrent sessions so more than half of attendees were hearing the talk for the first time. If your event is a single track and it is hard to repeat the same talk, have a session where organizers and attendees interact. You can collect useful feedback through fun live poll questions, such as “which city should we select for the next event?”, “what is the best part of this event?”, “would you be motivated to invite your friends to the next event if we offer you …..or improve …. ?”. Creating a poll and collecting votes is easy and fast with Whova. Nightmare: If you are organizing a large event with more than 500 or 1000 attendees, you may foresee long lines of people waiting to check in. Even smaller events can suffer the amusement line wait as a majority of people will arrive within the same 30-minute window. The only bad news is there’s no fun ride to help them forget the frustration they felt while waiting. This is not how you want to start your event so how can you speed things up? Having backup staff or volunteers is a start but there has to be a faster solution. If your event is relatively small, have a big desk with well-categorized badges and ask attendees to pick them up. While or after they move to the registration desk, scan their QR code on the badge to quickly check them in and give them a welcome package. If your event is large or too upscale making the first solution a no-go, have multiple concurrent ways to do check-in. For example, while some staff check in attendees with a laptop and/or printing a badge for walk-ins, other staff can walk up and down the line to check in registrants through an event app. See these 3 ways to check in attendees. QR scanning, mobile check-in, and web dashboard check-in are all synced in real-time within one event management software – you can also monitor/export the current check-in status. If you have many walk-ins, it might take a long time to generate name badges unless you don’t mind attendees handwriting their names. Even with that, you may have to check them into your system and allow them to use your event app. The best solution for this is to use an all-in-one system including a check-in tool, name badge generator, and an event app. For example, with Whova, you can enter a walk-in attendee’s information into a management dashboard, and click one button to print the badge out from a template design without switching between software. And, the attendee is ready to use the app. Nightmare: You are juggling multiple tasks, and at the same time you need to communicate with other organizers who are just as busy as you. Miscommunication or lack of communication can turn into chaos real fast. Email, phone calls, text, walkie-talkies . . . what is the easiest, effective way for event planning as well as on-site communication (even while monitoring A/V system in a keynote speech)? Group chatting through a mobile phone is recommended by many event planners. If it is not easy to have every staff member and volunteer install the same chatting app, leverage your event app as your team would be most likely to install that. 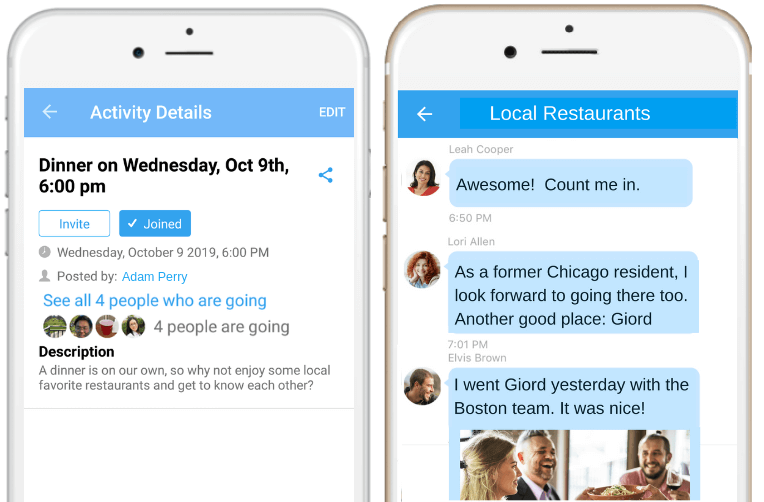 The Whova event app allows users to create private groups and invite people. Your team can start using the app for various internal communications (e.g. catering team, registration team, ..) one month before an event, and make it a centralized communication channel. If you are a manager, you can also send internal announcements to your team through a push-notification if something urgent happens during an event. Nightmare: You don’t want your attendees to start complaining about something that is not working or is inconveniencing them especially when you try new event tech. For example, at an expo, exhibitors may struggle with a new hardware device when scanning booth visitors’ badges or have to wait for organizers to export their leads information. Or, your attendees fail to access an event schedule from an event app due to a weak wifi signal. During an event, you will do your best to quickly seek solutions and calm people down by providing a guideline to all. But, you can also prevent the worst scenario ahead of time. No matter what event tech or trend you adopt, you need to check two things when deciding your vendor – in the end, a right tool and their support team will help you avoid hassle and save the day. How have other events used the tech or trend? If possible, check user reviews, ratings or success stories from trustful, objective places like app stores, Quora, or personal articles. Make sure that your vendors provide good customer support. You want to have great experts and helpers behind you. When nightmares happen at your event, you don’t have to panic. Instead, get ahead of the problems with a trusted ‘assistant’ in the form of an event app and/or event management software. Both can help you resolve issues and keep attendees happy without letting too much time pass. Prompt execution of a plan-B not only avoids attendee complaints but makes you a superhero saving the day. We would love to show you what Whova can help you prevent or how it can handle nightmares. Please contact us to request a demo or more information about Whova. You can also download a comprehensive event checklist to avoid missing 23 of the most common event details!